So let’s get real, on the subject of fear. Now and then people say to me, or they say to my friends, something about me being brave, with all this boat stuff. And I have to say, it’s not exactly bravery. There’s something to do with psychic muscle – so many plans made, so many people helping, so much generosity received. Such an opportunity, not to be left to pass by, floating away down the stream. So you say yes, and get in the boat. But it gets harder to leave, every time. Suzanne and I have bought a house – by the water, on the coast, in Maine. Gradually, through some combination of miracles that I cannot properly see ahead, I believe that we will actually move. But it makes departure from home – this home, of these last many years – that much more difficult, even just for a sail. 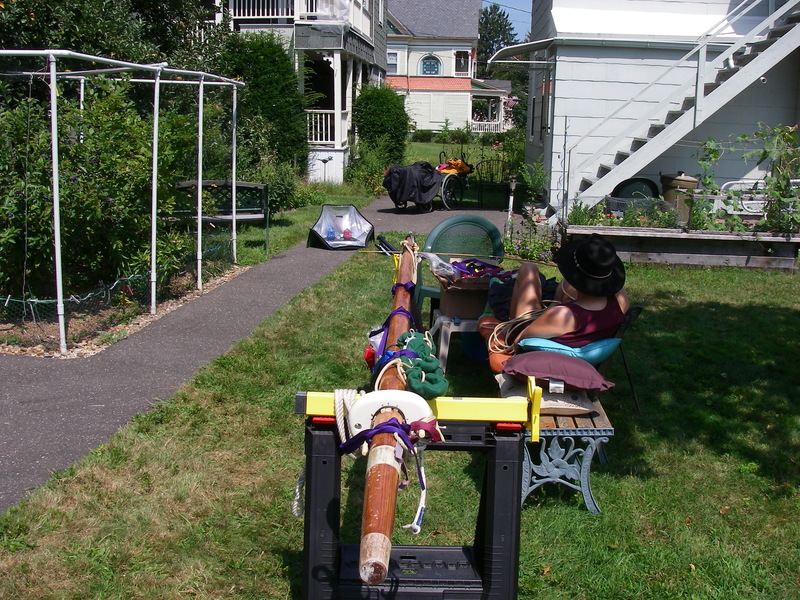 The summer is so sweet: ignoring the city sounds, hearing crickets and katydids, and the soft summer smells, Massachusetts hardwood forest, and a yard full of plants, August-green. Never mind the traffic, and the music from the cars and the bar down the street. Katydids, and crickets. Daytime birds, and the night, late, when the street finally goes quiet. How to leave? Knowing that I will probably not live again in this house, in August, with the summer smells, and night sounds of the raucous insects. I grew up in Massachusetts, and then went so far away, for so long. Utah, Arizona, California, and years in southern New Hampshire, not the same. Lived in the pine forest, in another corner of Massachusetts – beautiful, but no summer meadow. Arrival to the warmth of new friends is beautiful, and sweet. It’s the departures that I can’t stand. There was a date set: August 18, 2014. A Monday, with fine weather, and early in the week to avoid the heavy summer boat traffic on the river, and their big wakes at the ramp and adjacent dock. Melissa and Richard were set to bring their truck to Holyoke (from Maine – kind souls) to haul the boat and pop it in the water. Friends in Deep River were welcoming, with a spot at their dock all ready to go. And still, I was conflicted. For all the above reasons, as well as practicalities to do with the unfinished tasks. More rigging, especially – so much easier at home. Still, it could have been done. 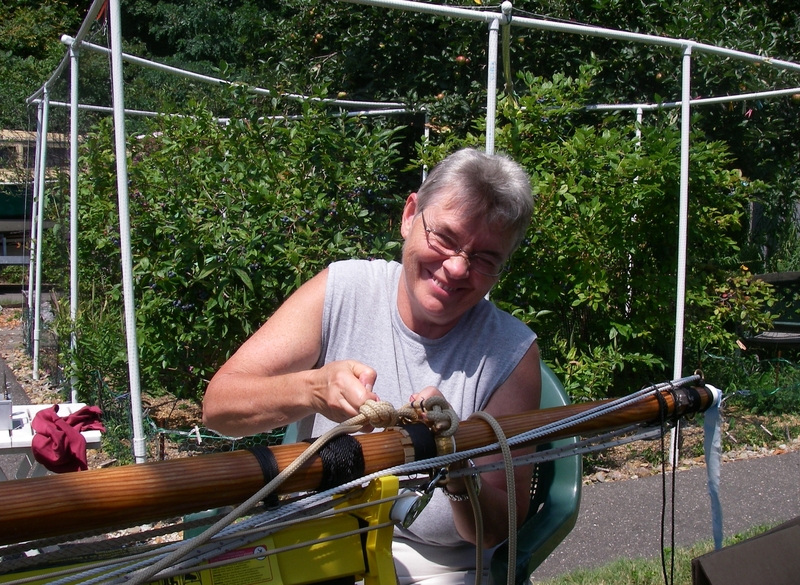 On the Thursday before, as every day since we set this date three weeks earlier, Suzanne and I went off for projects – this particular morning, more work on the wiring in the mainmast. We completed the connections at the top of the mast, and with a small 12 V battery clipped to the lower end of the wires, confirmed, with satisfaction, that the Bebi-adapted tricolor and the anchor light both worked. Next it was on to the lower end of the wires. There are so many opportunities for mistakes in a complex, long project such as this, and they are inevitable. In the normal, unhurried course of things this is not a terribly big problem – annoying at the time, and/or embarrassing, but over the long stretch of months or years, not particularly significant. For example, cutting a wire too short. Sadly, or perhaps for the best, I did that with one of our mast wires. There are reasons that this happened, clear in retrospect, but that did nothing for the 12 V wire that was now going to need more heat shrinks, and fuss, and complications with needing an extra person to help turn the mast in the garage so doing all that would be possible. All this on Thursday, when Friday morning was our chance to go forward with planned help for the items assigned to that day – NOT putting scant time into resolving this admittedly small complication. In a fit of frustration, I blurted out “I don’t even want to GO on this trip!” That has been so hard to prepare for, working these last weeks, Suzanne at least as tired as I, and equally frazzled. The ache of leaving, again. The boat not really ready, and myself either. In the end, thanks to that pesky wire, and the two of us out there crying in the driveway, together we pulled the metaphorical plug on this launch plan. It’s the best decision I’ve made in ages. I miss the sailing, and seeing everybody, and the quiet water. But I don’t miss the strain of departure, and the difficulties of sorting out the boat necessities so far from our handy shop. Tables for stretching out the mainsail with all its long battens, in comfortable positions for attaching the rest of the zillion lines and fussy ties. 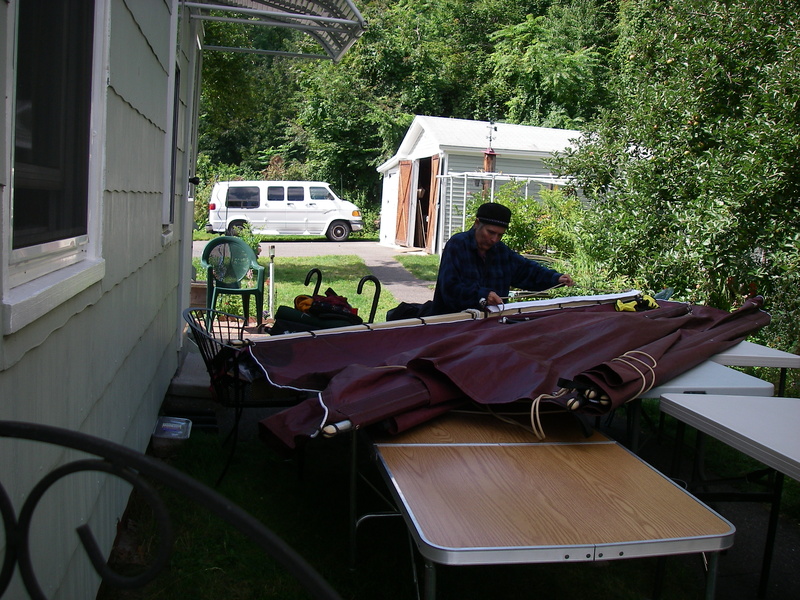 Sawhorses for masts, in easy locations in the shade, happy in the yard, tying on halyards and everything else. And I don’t miss the fear. A few days ago, Monday the 18th arrived, and passed, here at home. All day long I felt extra happy to be here. Now there’s a sign of a right decision! Work on the boat has continued, with comfort, and relaxed joy. Not without complication – it turns out that it’s really good that we didn’t leave, because drilling for the mainmast retaining pin has not been simple. And neither has raising and lowering that mast. There will be more to say about this, over time. But presently, the bottom line is that perhaps the boat will go in the water this fall, or perhaps not. It’s only August, and there are still September and October after all. Having missed the last two years of summer and early fall here at home, it might be just perfect to stay, and savor. The water is not going anywhere, and spring will come soon. With all the work that goes into preparing a boat, or even a trip, comes the pressure of making those preparations worthwhile. It’s good that you can step back, look at the big picture, and change your mind.